Because it's officially spring and it's Friday, I want to have a giveaway. I love having a digital kitchen scale, and want YOU to have one too! 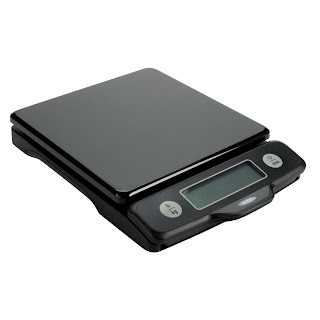 When my kitchen scale dies, this Oxo digital scale will be its replacement. Because it this nifty pull out display. No more peeking under the bowl or large plate to read the weight! Trust Oxo to design a product that is easy to use! Are you ready to enter? Since Blogger has taken away my numbered comments, I am trying Rafflecopter for the first time. Giveaway is sponsored by Frieda of Frieda Loves Bread, who just happens to love OXO products! Random.org will select the winning entry and I will verify said entry. If you clicked "enter" without completing your entry with additional info, it will be void. Yes, it would be simple to use this scale for international recipes! I'm trying out a few bread recipes over the next few weeks, and this would be perfect for measuring ingredients! My analogue scale isn't that accurate. My very first scale was an analog scale. Not as accurate as I needed it to be to weigh baking ingredients. Have fun with your bread baking! I want one so bad, but there are so many out there, but love the recommendation from "the bread Queen"! This sure looks easy and nice to use with the easy pull out so you can read the weight. 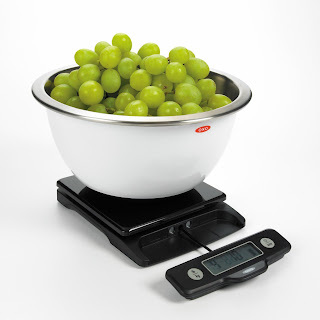 This would actually make weighing food fun. My scale is not digital and is difficult to get an accurate reading. I would love this to make sourdough bread! I seriously need a scale - I hate trying to bake without being able to measure by weight!! So many recipes come in weight, I would love to have a scale to be more accurate too! I've been wanting a scale for a while! This one looks awesome. I want one especially for measuring baking ingredients. I love Cook's Illustrated recipes, and they always stress using weights, so this would be awesome!!! You're so generous :) Thanks for your *great* website and recipes! I'd use it for when I'm baking since baking is so precise! I would love this, my old kitchen scale is so inaccurate! oooo! What a neat scale! Thanks for the chance to win it! I know that weighing flour & other ingredients is supposed to be more accurate than measuring by volume, but I've never had an accurate scale to do so. Since I bake a lot and make a lot of our bread, this would be a most welcome and well-used addition to my kitchen. I would love to win it! I would use this scale to weigh out ingredients, portions, and maybe even a piece of mail! It would be an appreciated addition to my kitchen! Thank you for the opportunity! I've used my scale to weigh a letter ~ Does it need two stamps or one? Comes in very handy! I LOVE my digital scale and have weighed it into the ground. The poor thing is on its last legs now, but it completely changed the quality of my baking. Suddenly things were airy and fluffy instead of blocks of wood. Everyone should have a scale. Very generous of you! Thanks! My mom and I are doing Weight Watchers, so we weigh things all the time. We're currently using an old postage scale with a manual weight that you move like a doctor's scale. I'd love a new digital one, especially with that pull-out display! I've been looking at digital scales for a while. First use - weighing the boys' Pinewood Derby cars ;) Then I'd use it to fine tune my bread baking to get more consistent results. We just had our Pinewood derby...never thought to use my scale for it! Great idea! This would help with Weight Watchers too! I've never owned a kitchen scale but thought it would be a handy gadget to have. I have a kitchen scale, but its not digital. It just gives me an estimated guess where as this digital scale would give me exact weights! This would help me so much with my weight loss and with my baking. I have always wanted a kitchen scale...for reals! Woould love a new scale....mine.....not so good. This looks like it's wonderful....wow to able to read the numbers. I like to weigh my grass fed beef so packages are in pound increments rather than random sizes. Much easier to add 1 lb packages for meals or selling. A good scale is great for dividing bulk packages into smaller servings, I agree! I don't have a scale and I would love one, plus I love OXO brand products! I needed a scale this week....I would use it to measure my meat portions and for cooking. It would be awesome. I'd get to keep a Kitchen scale in the kitchen! (As opposed to my husband running off with it to weigh e-bay shipments) Finally, I'd be able to make some of those recipes that are listed in ounces, jeesh! I never thought about using the scale to weigh for postage, but that's a great idea. I needed a scale just the other day: one ounce or two? My scale recently died and I miss it so! Love the pull-out reader feature vs. hovering in the space between the large dish and readout, trying to see! What an awesome giveaway. Talk about making life simpler! OXO makes great kitchen products. They are usually the first ones I go to when shopping to see if they have the item I'm trying to find. And usually they do so my kitchen has a lot of their products already. The scale would be a great addition as I have been reading a lot about bread baking and other yeast items such as a cinnamon roll recipe I recently got that calls for weighing ingredients rather than measuring. I would love to have a scale to see how much of a difference it really does make in the results. Also, trying to follow any type of diet really benefits from having a good scale such as this to help see what a true serving size really is. Thank you for the awesome giveaway and chance. Yes, I wish I had a scale when my kids were little...no more fighting over the biggest piece! i'd use this for baking....america's test kitchen is always telling me to weigh my flour! i'd also weigh small packages with it...multitasker! It's also great for dieters where they tell you to weigh out exact portions, like 3 oz of meat or 4 oz of veggies. This one would be much more accurate in the lower range. I would love to win the scale. Great giveaway Freida! I'd use this scale all the time for making recipes I post on my blog. I don't have a scale and would just LOVE one! I just saw the idea of postage, and now I totally need this. Hubby is always guestimating on how much postage he needs. I would love to use this scale for baking! scales are incredibly useful. Would love this! Cat, that's a great idea ~ I'm a snackoholic, especially at night! i'd use this for baking pastries! I'd use the scale also to measure out accurately the ingredients from the recipes of cookbooks I get overseas... hello metric system! I would love to be able to measure dry ingredients when baking to make things turn out even better! Sorry I didn't read the entry rule - I would use this to measure out the food I'm eating as I"m counting calories to be able to lose weight. I also think a scale would make less of a mess as you can make 'one dish' meals by measuring and combining all the ingredients in one dish (before cooking, baking, steaming, etc) !! I'm starting to learn to bake, and so the scale would be useful for some of the recipes I've been looking at. Ooops, are you able to see my email? Weird, I entered all except tweet at the beginning and it shows me as not entered at all. Doing again, this would be cool. Let me know if it doesn't work and I'll check my end for your entries. Good luck! I'd use it to weight ingredients for my baking! I'd use this is weigh cheese for baking. I also would use the scale to measure out servings of meat! I think I definitely make larger portions than the 6oz usually measured.